Amplified with reading lists and quotations from a wide diversity of writers, best-selling mystery author Susan Wittig Albert’s thoughtful and thought-provoking journal of the tumultuous year 2008 is a must-read for everyone fascinated by the writing life and the writer’s role in society. From Eudora Welty's memoir of childhood to May Sarton's reflections on her seventieth year, writers' journals offer an irresistible opportunity to join a creative thinker in musing on the events—whether in daily life or on a global scale—that shape our lives. 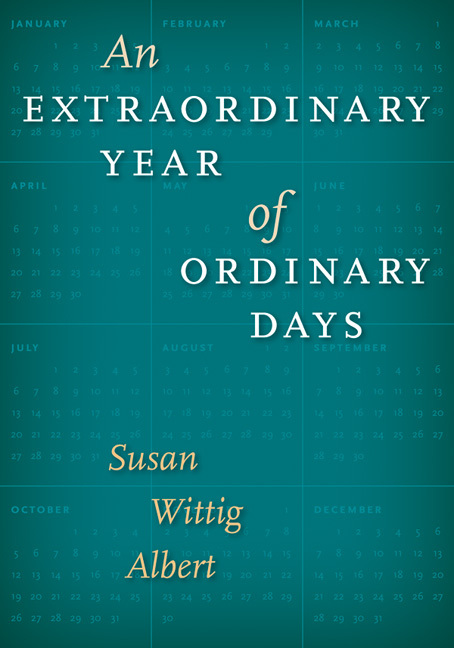 In An Extraordinary Year of Ordinary Days , best-selling mystery novelist Susan Wittig Albert invites us to revisit one of the most tumultuous years in recent memory, 2008, through the lens of 365 ordinary days in which her reading, writing, and thinking about issues in the wider world—from wars and economic recession to climate change—caused her to reconsider and reshape daily practices in her personal life. Albert's journal provides an engaging account of how the business of being a successful working writer blends with her rural life in the Texas Hill Country and the Sangre de Cristo Mountains of New Mexico. As her eclectic daily reading ranges across topics from economics, food production, and oil and energy policy to poetry, place, and the writing life, Albert becomes increasingly concerned about the natural world and the threats facing it, especially climate change and resource depletion. Asking herself, "What does it mean? And what ought I do about it? ", she determines practical steps to take, such as growing more food in her garden, and also helps us as readers make sense of these issues and consider what our own responses might be. For decades, it has been my habit to keep a journal, opening each new yearly record on January 2, my birthday. In these journals, I make notes about what's happening in my life, my work, the weather, the national news. The writing is not intentionally graceful, and I don't spend time making it pretty or lyrical. It's what I'm thinking, how I'm feeling, what's on my mind on any given day. I write for myself, as a witness to my life and to the world at large, a journalist who reports events, a recorder of words, thoughts, feelings, impressions. When I began the journal for 2008, I was looking forward to recording another ordinary year of ordinary days in the life of a working writer. I expected to meet contractual obligations for two novels; do some personal and professional traveling; attend a high school reunion (momentous: my fiftieth! ); connect daily with family and friends over the Internet; enjoy the company of my husband, Bill Albert; and spend quiet evenings reading, knitting, watching television and films. Although I didn't think about this in any conscious way, I expected to end the year with pretty much the same intellectual baggage that I carried into it. New ideas, yes. New ideas would be nice, and perhaps some new creative energy—but certainly not a paradigm shift. Not in the last third of my life, at sixty-nine. For one thing, the presidential race turned out to be not just interesting, but electrifying. From my perspective (I'm on the liberal side of the political spectrum), it was the best and brightest thing that had happened in a long, long time. Other good things were very good, of course, and welcome. The writing went well; my health stayed pretty much the same; the travel went as planned; and there were no family emergencies. The worst . . . well, let's just say it was a challenging year. Midway through January, I began to discover (via the Internet, then books) the potential seriousness of the energy depletion situation, something that shouldn't have surprised me, I suppose, but did. I spent the rest of the year educating myself to its consequences. Climate change was not news to me, but new scientific evidence of its acceleration (suppressed during the eight years of the Republican administration) heightened my concerns. Under the influence of several popular authors writing for a general audience, and others less widely known and more technical, I began to think more about the impact of both energy depletion and climate change on our system of industrialized agriculture, and I woke up with a start to the realization that our food system is simply not sustainable. It was time for me to refocus my gardening energies from ornamentals and herbs and begin gardening seriously, with the intention of producing more of our food. I started that project in late spring, although the extraordinary, record-breaking heat and drought of 2008 here in Texas (perhaps itself an evidence of climate change) certainly made gardening difficult. And there was more startling news, more unwelcome realizations. In February and March, the economic threat—home foreclosures, job losses, failures in the financial sector, tightening bank credit—began to impose itself on the country's awareness. As the summer wore on, the bleak national economic situation took on global dimensions and an intensely personal shape. By late fall, Bill's and my 401Ks had dwindled by 50 percent, and local real estate values were sinking rapidly. We were in better shape than many. Friends and acquaintances lost jobs, homes, businesses, investments. People began trying to live off their paychecks again, instead of their credit cards, and for retailers, the change was calamitous. By December, pundits had taken to calling 2008 "The Great Disruption," "The Colossal Collapse," and "The Year of the Apocalypse." Harvard economics professor Kenneth Rogoff called it "a once-in-a-hundred-years meltdown." Whatever name you give to it—personally, nationally, globally—2008 was an extraordinary year. And yet, as my journal records them, my days are very ordinary, filled with family obligations, work, play, and life in general. Like everyone else, I lived each day as it came, met the day's requirements, and then moved on. Both the journal and the year are set in the context of my life, and since you and I haven't met (most likely), an introduction might be in order. I was born on January 2, 1940, on the cusp of the Second World War. I spent my childhood on a farm and in small towns in Illinois, very much a 1950s rural Midwestern girlhood. I married at eighteen and embarked on a new life as a wife, then a mother (of three, born close together, in 1959, 1961, 1962), then a college student. In 1968, I moved with my husband and young children from Urbana, Illinois, to Berkeley and began graduate study. I took my first academic position at the University of Texas in 1973 and worked as a teacher and administrator (at UT, Tulane/Newcomb, and Southwest Texas State) through 1985, when I left my academic career and began to work as a full-time writer. I married Bill Albert the next year, and we moved to what is now a thirty-one-acre homestead we call Meadow Knoll, in the Texas Hill Country, some sixty miles northwest of Austin. For more than two decades, Bill and I have shared our lives with varying numbers and breeds of dogs, cats, chickens, ducks, geese, peacocks, cows, and sheep at the end of a rutted caliche lane, surrounded by hundreds of wild acres populated by deer, coyotes, mountain lions, armadillos, possums, raccoons, squirrels, skunks, and lovely, lovely birds. I've come to think of myself as that place, as Meadow Knoll, through all its changes of context and climate. And I am still that place, and still evolving, no matter where I am, no matter what other places I may become and in which I may evolve, before and since. Living in the country has enabled me to craft a quiet, inward-turning life in a fully wired, hyperactive, entertainment-obsessed society where, as psychologist James Hillman once remarked, anything short of manic behavior is considered depression. And it has opened a daily window on the natural world, schooling me in the habit of observing our domestic animals and the wild animals that share the fields and woodlands with us. Together, Alone: A Memoir of Marriage and Place (University of Texas Press, 2009) is my celebration of that life and the learning it has brought, and many of its themes are threaded through this journal. In the past few years, there has been less solitude. My books (I have been writing mystery fiction since 1992, juvenile fiction before then) reach more readers than they did in earlier years, which means that I must do more of the things that authors are expected to do: travel on book tours, visit libraries and bookstores, give talks, participate in social media on the Internet. I am also an active volunteer in the Story Circle Network, an organization for women writers and readers that I founded in 1997. The 2008 journal chronicles these various outreaches. The books have also permitted Bill and me to enjoy the wonderful privilege (truly a luxury) of having a second home—we call it Coyote Lodge—in a tiny mountain community in New Mexico. Being at home in two places means that we can each have time alone, which is welcome in a marriage in which we live and work together, twenty-four-seven. The 2008 journal records my weeks at Coyote in January, August, and December. I use my journal to record things other than my immediate life events. Like you, like all of us, I am shaped (often in more ways than I'm willing to recognize) by what happens in the world beyond me, and I'm in the habit of recording short news summaries of events that have some significance to me at the time they occur—although I can't always say exactly what that significance is until I can see a developing pattern. Years ago, I had the naïve idea that I was relatively untouched by things that happened outside my personal sphere. That probably wasn't true then; it certainly isn't true now. The world is very small: what happens in Washington or London or Baghdad or Shanghai touches me—sooner and more deeply than I expect. The news summaries track some of these events—and in 2008, there were a great many. I'm also in the habit of making notes on my reading, and I am an incorrigible collector of quotations, with the long-standing practice of adding other people's words to my journal pages. I almost always know the name of the author, but haven't always preserved the title of the book or article. If I am currently reading the writer's work, I list the title in the month's readings—you'll find it there. Readings. I am a text person. I write every day, read every evening, and keep an annotated reading diary. I soak myself in words, sentences, paragraphs the way some people soak in a hot bath. For years, I read nothing but fiction; now, I read mostly nonfiction—not by intention, but by interest. If I care about what I'm reading, I am an energetic, recreative reader: I make notes in margins, rewrite sentences, argue with the writer's opinions, insert quotations from related texts, annotate the bibliography. Like a bloodhound, nose to the ground, I follow developing interests, and if something catches my attention, I'm likely to follow that trail as far as it takes me, searching bibliographies and using the Internet to actively seek out related works. Looking at my 2008 readings, however, I have to say that they are much more focused than usual. Many of the issues I encountered proved to be extraordinarily compelling, and I read more deeply and more energetically and with greater attentiveness than I have in many years. A year in which Americans discovered the possibility of a new beginning, 2008 was a time of political change, of a new and optimistic hope, of expectations raised. It was also a year in which many were confronted by the stern reality of limited, diminishing resources we once thought unlimited and infinite. As I look back now over these pages and think about the tumultuous effect of these events on my life, on our lives, on everyone's lives, I am very glad that I have this personal record of what the year meant to me. I hope that as you read these entries, you will ask yourself, "What was I doing on this day, or that? How did I feel?" And most importantly, "What did it mean?" For me, in my own life, eternal questions. What does it mean? And what ought I do about it? Yesterday was the beginning of the new year. Today is the beginning of my personal new year: my birthday. The first day of my sixty-ninth year, the last year of my seventh decade. A good day to begin a journal, especially because yesterday, I finished the book I've been working on for the past three months: Wormwood , the seventeenth book in a series of mysteries featuring a character named China Bayles. It began in 1992 and will continue, I hope, for a good long time. Finished for now, that is, since I still have a final chapter to write and some tidying-up to do. But I'm ready to tackle something new. So I'm opening a new journal on the first day of my new year, a very ordinary day, as the poet Maxine Kumin says in Always Beginning , when I am grateful just to be going on with my life. I've been spending the winter holidays here in New Mexico. Bill arrived the day after Thanksgiving (bringing the cat) and left (with the cat) the day after Christmas; I arrived in early December (bringing our three dogs) and will leave (dogs, too) in a couple of weeks. I would love to stay here longer, but there are things to be done back in Texas. Here is Coyote Lodge, a small log house perched on a mountain slope seventy-five hundred feet above sea level, thirty miles northeast of Santa Fe, twenty-five miles northwest of Las Vegas, and forty miles south of Taos, on the eastern flank of the Sangre de Cristo Mountains, at the southern end of the Rockies. Through the wide front windows, I look north and west across the valley to a snow-covered ridge that rises to nearly ten thousand feet. Or down-valley, east and south, to Cerro Pelón, a bald, burly, white-caped sentinel standing guard at the valley's mouth. Distances are deceptive. This extinct volcano—once an inferno of fiery, liquid rock, now cold, solid stone, immovable—may look close, but it's thirty miles away and millions of years old. I feel some astonishment at this: at what seems to be an unchangeable landscape, but is constantly changing and being changed. In the life of the earth, it's fire one day, rock the next. Nearer by, though I can't see it from here, is a famous mountain. Earlier people called it El Cerro del Tecolote, Owl Mountain; now it's called Hermit's Peak, in honor of an Italian recluse named Giovanni Maria Agostiani, who came there in 1863 to live in a shallow cave below the bristlecone pines that rim the eastern, dawn-facing cliff, incandescent in the morning sun. I often try to imagine the solitude of that cave in the cool blessedness of the summers, the frigid fury of the winters. I can't. My view of Agostiani's mountain is blocked by the more familiar ridge behind our cabin, where snow-laden pines rise against a blue, oh so blue sky. But seen or unseen, Hermit's Peak is there, far beyond what is safe and imaginable. Who was the hermit, really, beyond the tales that are told about him? Where did he come from? Why? Whatever his story, Agostiani took it with him when he left the mountain in 1867. Two years later, his body was found beyond another mountain to the south of here, near Las Cruces. There was a dagger in his back. But it's all lovely, all of this, no matter how you look at it: from the dizzying, dazzling solitude of Hermit's Peak, from the safety of my sheltering ridge, from my window.